Living a Fit and Full Life: Protect Your New iPhone 7 with a Case from Speck! 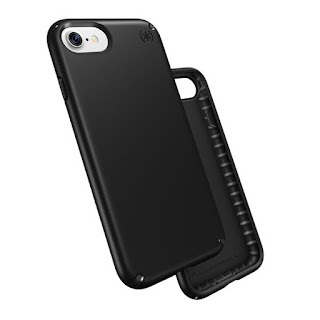 Speck Presidio cases feature the IMPACTIUM Shock Barrier. IMPACTIUM is a dynamic shock-suppression material that lines the case. Ridges of IMPACTIUM on the inside perimeter compress on impact to absorb and disperse shock. My husband recently surprised me with a new iPhone 7 and knowing that I have 4 kiddos I knew I needed some serious protection. 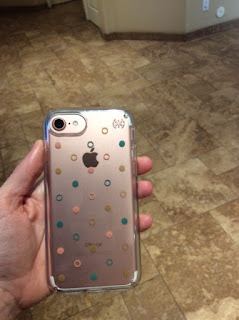 With this protection I also wanted some style which is why I love these cases from Speck! The Speck cases I received are all very stylish but also thin so it really doesn't change the way your phone feels. I went about a week without a case and was worried that putting a case on it would make it feel bulky. These Speck didn't seem to change the overall feel of the phone and I love how protective they are. I homeschool my kids and we use a lot of apps so naturally I allow my kids to use my phone which is great but I'd say my phone probably gets dropped on a daily basis. Then there's my one year old son who thinks he too gets to use my phone but mostly he just likes to chew on it. I have to add that I constantly clean my phone so while ideally I don't want him chewing on my phone it does happen. Speck cases have kept my phone safe for almost a month now and my kids have been great at testing the cases out. With each drop I cringe but alas my Speck case has come through for me again. I also have to add that I got the iphone 7 in rose gold and really didn't want to cover up the the pretty rose gold color too much which is why the PRESIDIO CLEAR + PRINT IPHONE 7 CASES are my favorite. It allowed me to add a little style to my phone but still allowed it's true beauty to shine through!